Is this stock art? Sorry, but yes. We dived into the one we made minutes after taking it out of the oven, before thinking of taking a photo. But for the record, it did look this good. This weekend, we had a lovely lunch at home with a friend that I haven’t seen in quite a while. I always love a good catch up – especially when it’s accompanied by some delish food! The recipe comes from BBC Good Food and will certainly join the summer tomato tart in our summer cooking repertoire (and by “our,” I mean the royal “our” in which I helpfully suggest delicious winning dishes, and my husband kindly does the cooking. Are you sensing a pattern?). I’ve tweaked a bit of the recipe for American purposes but some of it was eyeballing and guesstimation while the royal “we” went along, and “we” did use scales for weight. Bring the cream to the boil in a small saucepan, then take off the heat and drop in half the bunch of basil, making sure all the leaves and stems are fully immersed. Leave to infuse for at least an hour. Transfer to a lidded container and chill once cool, if preparing the day before. Meanwhile, roll the pastry out on a floured surface to about the thickness of 2 x £1 coins and use to line a 23cm loose-bottom tart tin. Chill on a baking sheet until ready to use. Blanch the broad beans in a pan of boiling water for 1 min. Add the peas, bring back to the boil for another min, then drain and cool quickly under the cold tap. Drain, then dry on kitchen paper. Set aside. Heat grill to medim and cook the pancetta until it is crisp and golden, setting aside on kitchen paper to absorb any fat. Can be prepared up to this stage a day ahead. Heat oven to 400 degrees F and put a second baking sheet in the oven. Line the pastry case with parchment and fill with baking beans. Slide the tin onto the hot baking sheet and bake blind for 15 mins, then lift out the paper and beans and cook for 5 mins more, until the pastry feels sandy. Meanwhile, strain the cream through a sieve, pressing the basil against the mesh with a non-metallic spoon or spatula to extract as much of the flavour as possible. Turn oven down to 300 degrees F. Beat the eggs into the cream, stir in the parmesan and season to taste. Tear the pancetta and sprinkle into the case, along with the peas and beans. Pour in the egg and cream mix. (You may have a little left, depending on the depth of your tin.) Bake for about 50 mins-1 hr or until the custard is just set in the middle. 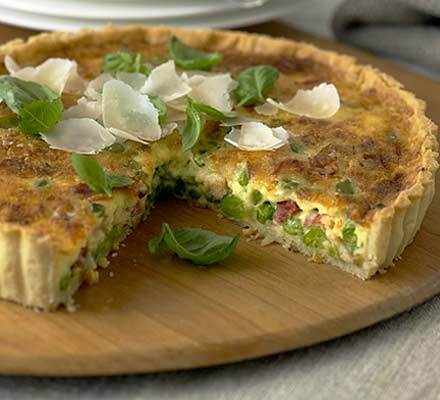 Serve warm or cold, topped with shavings of parmesan and the remaining basil leaves.